Spirals are magical. They move and manage to somehow stay the same and change at the same time. They lead you in and send you out … more than one magical journey has begun with a spiral. I bought several skeins of Lion Brand Fun Fur to make a humiliating cat bed or two for my kitties. 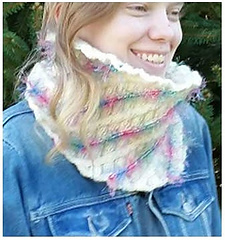 I never thought I would use Fun Fur in a design, but then I thought up this cowl, and a matching hat. It seemed like a magical combination. The spirals in this cowl are 2-stitch wide, left-slanting cables, over a 2x2 rib, making a nicely stretchy fabric in a winter white, worsted weight yarn. Then, to make it truly magical, brightly colored fun fur is crocheted in slipstitches up the bars between the cable stitches on every other cable. Fun fur is, well, fun! But one definite problem it has is being a little scratchy against the skin. Using slipstitches in this way keeps the fun fur to the outside of the piece, and also allows you to have small accents of it, instead of possible overkill, without worrying about floats. Start your own magical journey with this cowl. It’ll be fun!